Zhoushan City is located in Zhoushan Islands, Zhejiang Province. It is also located in the southeast coast of China, the south of the Yangtze River estuary and on the East Ocean on the outer edge of Hangzhou Bay. It is between 121degrees 30 minutes and 123 degrees 25 minutes longitude east, 29 degrees 32 minutes and 31 degrees and 4 minutes latitude north. It has a 182-km-distance from east to west and 169 from south to north. Zhoushan is backed by large and medium-sized cities like Shanghai, Hangzhou, Ningbo, and the vast hinterland including Yangtze River Delta. 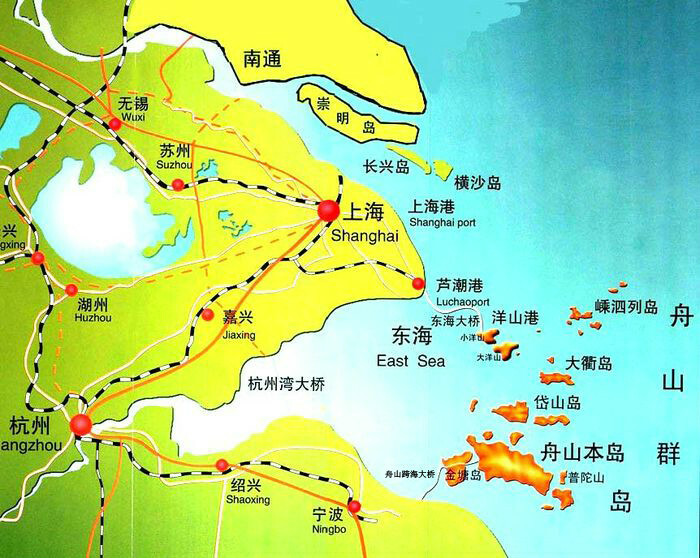 Facing the Pacific Ocean, Zhoushan owns a strong geographical advantage. It is an intersection hub between national north-south coasting shipping lines and Yangtze River waterway, a seaside gateway and a channel for opening of Yangtze River areas and Yangtze River Delta, and it fans out with Asia Pacific emerging port cities.